Universal Pictures has released a first look at "First Man." The studio on Friday (June 8) posted its first trailer for "First Man," director Damien Chazelle's feature film starring actor Ryan Gosling as Neil Armstrong, the first man to walk on the moon. "A visceral, first-person account, based on the book by James Hansen, the movie will explore the sacrifices and the cost – on Armstrong and on the nation – of one of the most dangerous missions in history," reads the movie's official website. 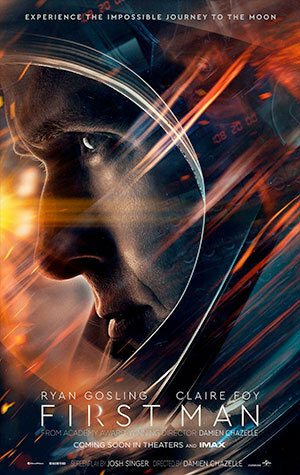 The trailer sets up the film's focus on Armstrong, his years as a research test pilot and then as an astronaut, building up to what the movie's tagline describes as the "impossible journey to the moon." In July 1969, Armstrong commanded Apollo 11, NASA's first mission to land humans on the moon. The two-minute teaser provides quick glimpses of Armstrong (Gosling) piloting the X-15 rocket plane and as command pilot for his first spaceflight, Gemini 8 in 1966. The trailer also includes scenes based on Armstrong's private life, in particular his relationship with his first wife Janet, played by Claire Foy ("The Crown"), and with his children. Opening in U.S. theaters Oct. 12, "First Man" reteams Chazelle and Gosling, who worked together on the 2016 "La La Land." Screenwriter Josh Singer ("Spotlight," "The Post") adapted Hansen's 2005 biography of Armstrong for the film. "First Man" also features actors Corey Stoll and Lukas Haas as Armstrong's Apollo 11 crewmates Buzz Aldrin and Mike Collins, Christopher Abbott as Gemini 8 pilot David Scott, and Jason Clarke, Kyle Chandler and Pablo Schreiber as astronauts Ed White, Deke Slayton and Jim Lovell. “First Man” in no way lacks in patriotism, though. Chazelle embraces the American legend without emblazoning star-and-stripes iconography in every scene — this isn’t another installment in the “Captain America” franchise. Despite the controversy, as well as concerns about the restricted creative liberty associated with biographical films, “First Man” blasts off by revealing a new angle of the same story so commonly known to American viewers. Based on James R. Hansen’s biography of Neil Armstrong, “First Man” chronicles Armstrong’s journey through NASA’s space program in the 1960s, as the United States engaged in a fierce Space Race with the Soviet Union. The film also emphasizes the duality of Armstrong (Ryan Gosling) as both the first man on the moon and the head of a typical family. The movie prominently features the effects of Armstrong’s pursuit on his home life. Audiences see Armstrong grow further from his wife, Janet (Claire Foy), and children as he gets closer to the moon. The film is abrupt and clunky at times, but so were the efforts of NASA in getting man on the moon, and they still succeeded. Similarly, while “First Man” doesn’t reach the same heights as Chazelle’s past films, it does retain the same affecting features — Chazelle tells big, well-known stories and balances them with small, private, human dramas. From the get-go, Chazelle established "First Man" as a more intimate account of a nationally-acclaimed story. Audiences see sides of Armstrong often overlooked in lieu of his achievements, such as the strain put on his private life by his public presence. This adds to the emotional investment viewers have in Armstrong and heightens the significance of the climax — the movie is about the man, not the mission. Viewers find themselves disregarding the fact that a man made it to the moon, overjoyed instead that this specific man made it to the moon. Chazelle builds an intimate atmosphere with his lens, often placing the camera almost too close to the characters. The movie focuses less on rocket ships than on Gosling’s taciturn, troubled and zealous portrayal of the astronaut. This closeness carries over into scenes of actual space travel. Whether during tests of equipment or the final journey, viewers only see rocket launchings from Armstrong’s perspective. The audience is immersed in the experience of the individual at all times. Although outer space seems to be the new World War II of cinema, this doesn’t feel like just another trip through the galaxy. The ending of the film is genius. Very Chazelle in style, it encompasses everything a viewer would expect in the aftermath of Armstrong undergoing such an unthinkable ordeal. It’s incomplete, but it’s perfect — it gives the audience exactly what they need, no more, no less. "First Man" is the first biopic of its kind. Chazelle has crafted an out of this world film that remains wholly tethered to the plights of its inhabitants.